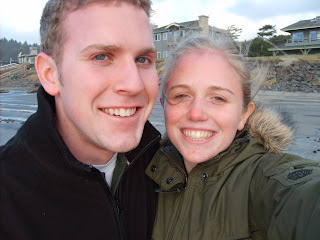 We met at BYU on the first day of orientation when I laughed so hard (at the fact that we were singing an intermediate hymn in a pep assembly) that I kind of threw my head back and hit his knee. (He was sitting behind me.) We chatted on the way out of the assembly (me apologizing and stuff) and then we ate a yucky lunch together that orientation provided. On our way out of lunch in a big field, I threw up from the smell of the sewage sprinklers and he didn't notice that I stopped to throw up, so we kind of lost each other. So we both went to all the stupid orientation stuff so we could keep seeing each other. Finally we decided just to hang out together. We were friends for about a month and then we started dating. We dated our whole freshman year and then he went on his mission. We wrote the whole time, but I dated a few other guys too. Then Bryan came home and we were in love and we got married and you said, "Do you like techno? M-zah m-zah m-zah m-zah" and then a year and a halfish later we had Olivia. The end. Just ignore the family jokes if you don't get them. Anyway, just thought you might all enjoy a little insight into our funny/weird little lives. Haha. Hooray for the intermediate hymn at the pep assembly that made you laugh! Hooray for Bryan coming home from his mission and you two falling in love with each other all over again. Hooray for Olivia! And I was there for the intermediate hymn! It pleases me greatly. Yay for love n stuff. Oh yeah. Clarence.